This is the first time this stamp set has seen INK... can you believe it??? I wanted this set in the worst way... and then I never even used them - UNTIL my friend Kim used this set here- and it gave me some ideas... So thank you Kim! Anything to keep my mojo flowing! I loved the Cherry Cobbler snowflake (from Northern Frost) added to the ribbon, then had to add some Crystal Effects to it - but I think its still wet in the picture! 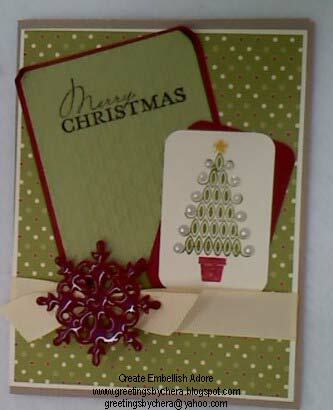 The Old Olive is embossed with the Lattice embossing folder (Big Shot). The layout I saw on some challenge... and I liked it but wasn't sure where I would use it. So what set did you HAVE TO HAVE and then not INK for a LONG TIME? I want to know ??!!?! Gorgeous card, love the shiny snowflake, it's beautiful and the pearls on the tree are so pretty. I'll have to send you over some more samples of this set, a group of us did the swap and they have them all posted...give you some fabulous ideas! Thanks for sharing with me! I love how you offset the image piece and the sentiment piece, and your snowflake is very pretty, excellent work.